More than 90% of migratory birds are poorly protected on their marathon journeys around the world, according to research. Many birds are at risk when they stop to feed, rest or breed en route, say scientists. They are calling for new reserves around the world to protect migratory species. 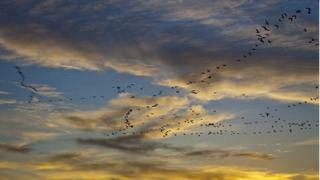 Most migratory birds have declined in past decades, from threats such as habitat loss and hunting. Migrant birds are the endurance fliers of the bird kingdom, making remarkable journeys across land and sea. The arctic tern, for example, flies the equivalent of the distance to the Moon and back three times in its lifetime. And the bar-tailed godwit may fly for more than 10,000km (6,000 miles) in a single stint, the longest continuous journey that has ever been recorded for a land bird. Dr Claire Runge, of the University of Queensland, the lead researcher of the study, said more than half of migratory bird species travelling the world's main flyways had suffered serious population declines in the past 30 years. "This is due mainly to unequal and ineffective protection across their migratory range and the places they stop to refuel along their routes," she said. "So even if we protect most of their breeding grounds, it's still not enough - threats somewhere else can affect the entire population." In the study, published in Science, researchers from Australia, the US and the UK looked at protected areas within the global routes of almost 1,500 types of migratory bird. They found only 9% of species were fully protected across their range, compared with 45% for bird species that did not migrate. "Migratory birds have a particular set of conservation needs and we found that these are not being adequately met compared with resident species," Dr Stuart Butchart, of BirdLife International, in Cambridge, told BBC News. The research found that countries such as France and Venezuela meet targets for protected area coverage for more than 80% of migratory bird species whereas others such as China and India meet targets for less than 10%. But it is not just developing nations losing their birds due to a lack of protection. Many Central American countries meet the targets for more than 75% of their migratory species, but the same species have lower levels of protection in Canada and the US. Prof Richard Fuller, of the ARC Centre of Excellence for Environmental Decisions, in Australia, said there was an urgent need to coordinate protected areas across the birds' full migration route. "We need to work together far more effectively round the world if we want our migratory birds to survive into the future," he said.